IMPORTANT NOTE: We are not lawyers, even though we have some significant experience of reading the EU's legal or quasi-legal announcements over several years. We have sought legal clarification from Lawyers for Britain and from other Counsel, and are awaiting their opinion on what we have written above. We will revise if necessary, although we don't expect that we will have to. UPDATE: Lawyers for Britain have said that this new agreement does not change the UK's power of veto under the Treaties. Technically this may be true, but politically we still believe that what Mrs May agreed to will impose severe political restrictions on what the UK can and can't do over the next six months. Let's just say that we doubt that the UK's veto will be exercised on any EU decision. 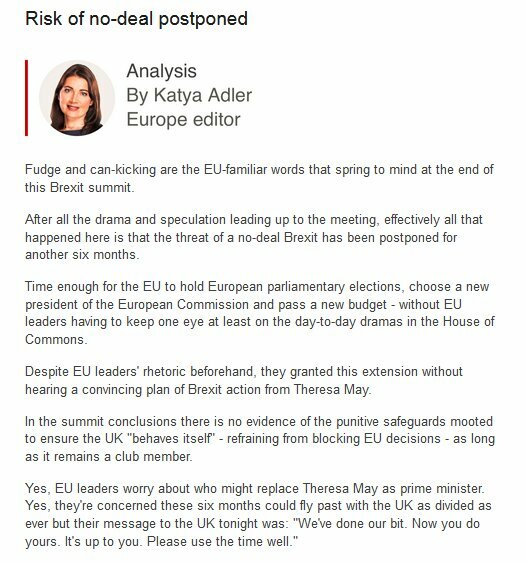 Either the BBC’s Europe Editor is incompetent, or she is deliberately misleading the British public. For her to state that “there is no evidence of the punitive safeguards mooted to ensure the UK ‘behaves itself’ - refraining from blocking EU decisions - as long as it remains a club member” – is demonstrably wrong. Oh my God, she is the problem. So weak-kneed as to make the country the laughing stock of Europe and the other MP's let this happen. The people voted leave, they might as well voted for pigs to fly. Rip UK. "We have criticised Mrs May from the start of her campaign to become Prime Minister – something which initially lost us a lot of readers. Fortunately many came back as our concerns were borne out by her actions." I am sorry to hear this, but it was also clear to me from the beginning that she was put in place for a reason. That reason is now crystal clear. No vote,no veto,taxation without representation. This is calamitous for the UK. Puppet Theresa is ripping us to shreds. Nothing at all has gone the way of leave supporters. Ladies and gentlemen,we are prisoner's in our own country. Our EU government have done their job well. Our brexit mep's will be sitting rag dolls. Mrs may must go now! Six more months not to prepare for no deal. Six more months for the Tories not to remove May. Six more months for how many more votes on the WA? Six more months of pointless "debate" in Parliament. Six more months of the BBC telling me how reasonable the EU are. Six more months for us to continue the arguments for Brexit. Six more months to fight for democracy. Here are some cans you can't kick down the road Mrs May: the local elections and EU Parliament elections. You will be destroyed. Very well said Patrick F, I particularly love the line "Six more months for how many more votes on the WA?" - that is a poisoned chalice if ever there was one. It certainly is not leave as LeavemeansLeave in any sense of the word. It was also clear beforehand what would happen last night with the special summit. It's all pantomine and a sick joke on democracy on the voters. 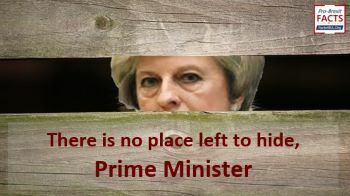 If the Conservatives don't get rid of her, they are going to deservedly get a thrashing in the next GE, if one is allowed of course. The country may be that far down the pan by then. I am sorry to sound so despondent, but in 66 years on mother earth, I don't think I have ever seen a more incompetant government cabinet. There are some quality people in the party but none have the guts to overpower the side of the party that is destroying everything that was once considered normal in Great Britain. That makes me very sad for the country, it could be so great again, but it has been infilitrated by so many dark forces that I fear for its survival. Is this a weak spot? What if protesters blockade polling stations, or run off with the ballot box? Will we have to hold elections under high security as they do in some 3rd world countries? Will we have to have independent monitors assessing whether it is a free and fair election? What a joke we've become. If we got a new Tory leader who cancelled our participation in the European Elections, presumably that would also mean we leave the EU automatically? I believe Mrs May was put in place by leading Remainers to deliver either BRINO or completely sabotage BREXIT! My heart sank when she was made PM and unfortunately I have been proved correct. What now? Do the Conservatives really believe after this we will vote for them? 1. Your statement "Today we must go one step further. We believe her to be mentally unfit to govern.". Alternatively, it could be that John Petley's allegations are all true, and she is being blackmailed by Merkel. That is, she must agree to whatever the EU wants, including passing the WA, or the transcripts (or recordings) of the May-Merkel collusion/conspiracy meetings will be made public, and she will face treason charges. 2. If the UK doesn't 'behave', as Farage has promised, will they kick us out early with No Deal? This (almost certainly) unlawful act has one aim - to 'persuade' MPs to vote through her surrender Treaty & legally bind us. Bear in mind whenever she says "a deal in Britain's interests" that she tweeted that she believes that remaining in the EU was 'in Britain's interests'. We have to ask ourselves why the Conservative and (European) Unionist Party has done NOTHING of note to prevent this shambles. There have been multiple opportunities to do so but they still allowed this embarrassment to continue. Some still believe changing their figurehead will put the party back together. It's like watching the chairs being rearranged on the Titanic. Just like labour, it is rotten to the core. Those few who still believe in democracy, and even fewer in Labour, need to recognise that the love of their life has been playing away for 45 years & is now just flaunting their affair in your face. Just like the EU, you need to walk away to save yourself. The precedents set have now set the stage for tyranny. For those thinking that it's a good thing, remember that when it is used against you as it well may. Since June 2016, no-one has been able to blame the EU. This is a 100% clusterf*** by our own Parliament who want to play at politics whilst outsourcing the big decisions to the EU. None of the main parties stand for democracy, as clearly demonstrated by their actions, which are treasonous. Nobody who believes in democracy should ever vote for them again. The Govt & current Parliament need to be brought down. If the 17.4m plus others who believe in democracy pledged just £1 to crowdfund a legal case, it would help. This abomination must be stopped.